I’ve seen a ton of great business ideas come and go. Some of them were ahead of their time, others were great ideas poorly executed. Most often though, great ideas go down in burning flames because people aren’t patient enough to let their ideas blossom and grow. They want to get from small to huge in a blink of an eye. SoupCycle is a fantastic example of a great business, based on a fantastic idea that is getting the time and space it needs to really grow. The entire SoupCycle company is comprised of just three people. (Pretty mind blowing when you hear other local start ups like Forkfly have 16 employees!) Owners Jed and Shauna handle every aspect of the business from soup to nuts (quite literally) with some help from one other part time delivery person. The impact of this is a business whose owners are extremely in touch with the actual business and its customers. For example, as part of SoupCycle’s regular weekly email to their customers, there is a request for feedback on each week’s soup. SoupCycle makes changes to their line-up based directly on that feedback. The SoupCycle service is a pretty simple concept. 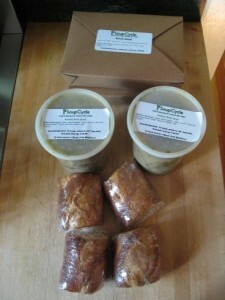 Every week SoupCycle delivers a container of soup, a box of salad and some bread. If you’ve got a bigger family they deliver two containers of soup, and two boxes of salad. One of the things that sets them apart from other food delivery options is that they deliver this soup entirely by bicycle. SoupCycle ‘s soup selections are entirely based on ‘what’s in season locally’ and their bread is baked at a small local bakery (Little T American Baker). For my first SoupCycle delivery I was greeted by owner Jed Lazar and handed two quarts of Potato Kale soup (the vegan option) along with four big slices of french baguette and two boxes of salad. Jed rides a recumbent bike with an electric assist. 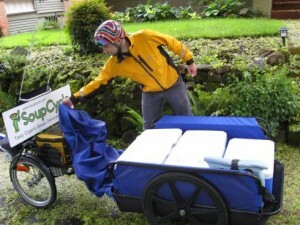 By the time he delivered our soup he had already clocked an impressive sixteen miles. The soup is delivered cold and SoupCycle recommends you put out a cooler if you expect to be away for more than three hours during their delivery days. Many people get the soup delivered to their office so they can take it home from there. The evening of our first delivery we heated up the Potato Kale soup and had dinner in moments. The two quarts of soup easily fed my family of five (two adults and three children) with about one serving of soup left for leftovers. 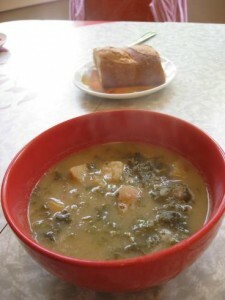 The Potato Kale soup was delicious, well spiced, perfectly cooked and brimming with flavor. I had heard a lot about SoupCycle’s salad dressing (which is also impressively vegan) and so was eager to see if it lived up to the hype. It does. The salad is a nice mix of fresh greens, shredded carrot and cranberries but elevates to something entirely amazing with the dressing. With SoupCycle’s soup being so good it’s hard to say that you should try their service out just for the salad dressing, but it is THAT good. The bread from Little T was soft and flavorful and I recommend you try dipping it in the dressing! SoupCycle offers three different options for their soups: vegan, vegetarian and an option with meat. Jed indicated that their most popular selection is vegetarian even among people who eat meat. A flavorful cumin-infused tortilla and corn soup. Your mouth will approve of this tasty soup that’s full of nutrients. Made with coconut milk. One of the best chicken noodle soups you’ll ever taste. Savory chicken, wide noodles, plenty of celery and carrots and just the right spice. Hearty lentil soup with flavorful vegetables, the distinctive taste of red wine vinegar and a touch of Dijon mustard. Sweet and savory carrot soup with a strong punch of ginger. A creamy clam chowder so tasty you’ll think you’re dining in New England. To order SoupCycle, you sign up for a SoupScription on SoupCycle’s site which sets you up for a weekly delivery of the soup style of your choice. SoupCycle bills you the Wednesday of your delivery and you can make changes to the following week’s delivery (vacation hold, adding or dropping your level of soup or going a la cart without salad and bread) by Friday at midnight. SoupCycle soupscriptions start at $18 for 1 quart of soup + bread and salad (which serves 2 people) and goes all the way up to dinner for 6. The soup, salad and bread for 4 at $30 ended up feeding 5 of us for a net cost of $6 per person for fresh, local and organic soup delivered. A pretty affordable option for such a tasty meal. I knew I liked the concept of SoupCycle but I’m frankly surprised by just how much I enjoyed the whole SoupCycle experience. It’s refreshing to deal with a company so committed to its customers with such a high quality product. SoupCycle’s soups are just plain fantastic and when you combine that with their truly exceptional salad dressing you’ve got a combination that just can’t lose. I highly recommend SoupCycle!